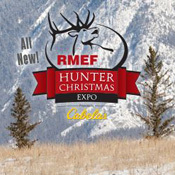 The attendee count was close to 87,000 for the Rocky Mountain Elk Foundation’s 2015 Hunter & Outdoor Christmas Expo. Presented by Cabela’s in Las Vegas from December 3-12, the Expo featured a wide variety of exhibitors, from outfitters to apparel and accessory companies to jerky suppliers. Million-dollar RVs and camping equipment suppliers exhibited in force. An exhibitor manufacturing custom-made tables from giant sequoia trees illustrated the diversity in products available to the public. Located in the South Halls of the Las Vegas Convention Center (LVCC), the Expo occupied the top level of the hall, while the popular Wrangler NFR Cowboy Christmas event was held on the first floor. And over at the Thomas & Mack Center, the National Finals Rodeo was in full swing. All in hall, cowboys and cowgirls, big and little, covered the Las Vegas strip. Best of all, admission to the combined event was free. More than 900,000 square feet in the LVCC provided for a holiday shopping mecca. The Cabela’s exhibit, along with RMEF’s trading post, featured a wide array of apparel and footwear. Noted sportswoman and outdoor enthusiast, Kristy Titus, made several appearances at Cabela’s, introducing her jewelry collection. The Chevy truck exhibit was also a major attraction. And Rutting Ridge Cellars was there for the official launch of our Cabernet Sauvignon.